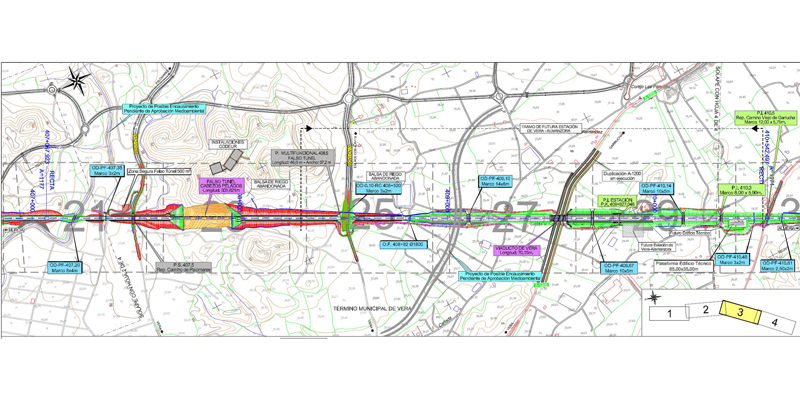 Design of a new double track sub-structure of a high speed line of 13,5 km total length, including civil engineering and infrastructure, replacement of all urban facilities, right of way and utilities affected. It also includes the design of the new Vera-Almanzora Station. The following environmental documents were drafted: noise and vibration Studies, Cultural Heritage Document, Hydrologic system and water quality protection Document, Supporting study wildlife crossings, protection of vegetation Document, cattle trails replacement Document, backfilling and borrow pits Document, and encompassing all previous an Environmental Integration Annex. The length of the project was 13.5 km of a new double track high speed line. It includes the design of the new Vera-Almanzora Station, Cabezos Pelados tunnel (306 m), 5 viaducts, which have a total length of 1,130 m (the 477 m long viaduct over the Almanzora river among them), and 4 multifunctional crossings, cut and cover tunnel type, which allow wildlife and roads cross over the railway. 3 overpasses and 6 underpasses of highways and roads have been designed as well. The project is completed with the definitive design of all elements of civil engineering and railway infrastructure, the replacement of roads, right of way and utilities affected by the project, and with the expropriations dossier.